Wondering where to take your next weekend adventure, mama? We’ve put our heads together to round up the best outdoor playgrounds in Singapore. Check out our video below to see our Top 10 picks! While we’re lucky to live on an island filled with fab parks from end to end – not to mention tons of indoor playgrounds perfect for when the weather gets too hot (or rainy) – is there anything better than watching your kids soar to new heights on a swing or beam with pride after climbing to the top of a pyramid? And then there are the myriad benefits of outdoor play, from risk-taking to socialization to the mood-boosting effect of sunshine. 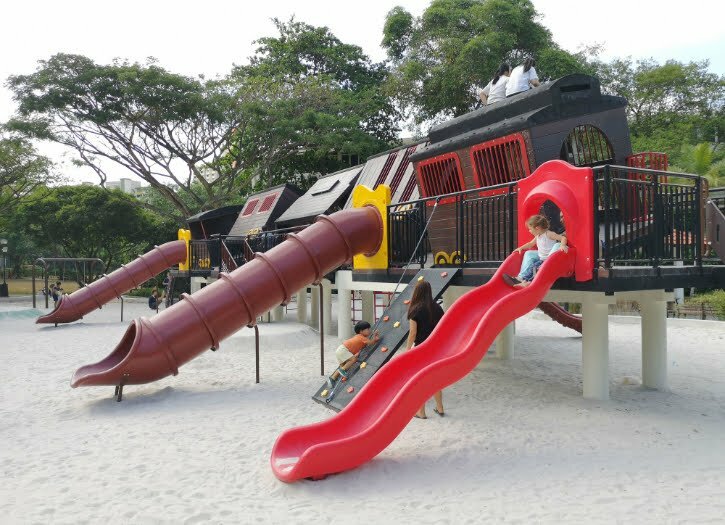 Every playground covered features both toddler and big kid play areas, and many have special features that set them apart from the pack, whether it’s the whopping 26 slides at Admiralty Park, the giant lighthouse at Marine Cove, or the naval-themed battleship structure at Sembawang Park. You’re also apt to find plenty of shade, handy kids’ toilets and changing areas, and nearby food outlets, too. NB: The awesome Palawan Pirate Ship at Sentosa was originally on our list, but then we got the sad news that it’ll be closing on 15 April. Click here to see why it’s well worth a visit in the next month! Click through our gallery for all the deets (including how to get there), and let us know your faves, mama! With a whopping 26 slides – as well as swings, climbing structures, a zip line, and separate areas for toddlers and big kids – Admiralty Park in Woodlands is hands-down one of the coolest playgrounds in Singapore. You could easily spend a few hours here, mama (we certainly have! ), and there are also convenient amenities like kiddie sinks and toilets (BYO hand sanitizer, though! ), nice wide paths for scooting, and a Sakura Buffet adjacent to the parking lot (in case the kiddos get hungry). Closet MRT: It’s a 15-minute walk from Woodlands MRT. The 169, 903, and 911 buses all stop near the park. Reflecting the rich naval history of Sembawang (mamas will love gawking at all the gorgeous black and white houses in the ‘hood en route! ), this super cool battleship-themed playground rates for its expansive sand pit and challenging climbing activities (there are lots of ropes and ladders – perfect for aspiring pirates!). Facing the Straits of Johor, Sembawang Park also offers up a lovely beach and barbecue pits aplenty. It’s a bit of a trek to get out here, but you’ll be rewarded with plenty of peace and quiets and virtually no crowds at all. Bliss! Closest Car Park: The park has two (free!) parking lots, one by Tuah Road and one by Sembawang Road. Each is a few minutes’ walk to the playground in the center of the park. Closest MRT: Sembawang MRT/LRT station is about 7 minutes away by car/30 minutes on foot. The 882 bus stops right at the park. NParks is on a roll with all their playground revamps! Newly re-opened in January 2019, this spacious playground nestled between the Kallang River and a little pond features lots of sand, six big kids’ swings, a climbing frame and two tunnel slides. There’s also a pirate-ship structure that’s fun for littlies. Thumbs up for the fact that it’s mostly shaded, too! NB: There are actually multiple playgrounds within the park; the inclusive playground is on the eastern side of the park. Closest Car Park: Bishan Ang Mo Kio Carpark B is close by to GRUB. Closest MRT: Ang Mo Kio MRT is a 30-minute walk away; many bus lines stop nearby the park, though. The Far East Organization Children’s Garden at Gardens by the Bay (whew, that’s a mouthful!) serves up a combination of a both a splash pad and a [blessedly shady] adventure playground with treehouses, rope walks, and a 130m nature trail. This is definitely one to bring your swimsuit and a towel along to, mamas, as it offers the perfect antidote to a hot day of exploring Gardens by the Bay. NB: The park is closed every Monday; weekday opening hours are from 10am to 7pm (splash pad closes at 6:30pm), and weekend hours are from 9am to 9pm (splash pad closes at 8:30pm). Closest Car Park: The Main Entrance Parking lot is about a five-minute walk away. Closest MRT: Bayfront MRT is about a 20-minute walk away. The 400 bus also stops outside Gardens by the Bay. There is soooo much to love about this corner of Singapore Botanic Gardens, from the water fountains and classic giant treehouse slides (set in a giant sand pit with lots of lush shade), to the kid-friendly fare at Food for Tots, to all of the new additions that were opened in 2017, including (but not limited to) a zip line, an accessible trampoline, and an educational canopy walkway. In fact at four hectares, Jacob Ballas is officially the largest children’s garden in Asia! NB: Opening hours are 8am to 7pm (last admission is at 6:30pm – entry is free of charge), and it’s closed on Mondays! Closest MRT: It’s an easy 10-minute walk from Botanic Gardens MRT. There are also heaps of bus services that stop nearby on Bukit Timah Road. Closest MRT: Eunos at Still Road – but it’s not that close! The 401 bus stops right by the playground, though. If your kiddo is obsessed with airplanes (and who isn’t at one point or another), Seletar is perfect for its combination of airplane-themed play equipment and the opportunity to watch aircraft landing and taking off at the adjacent private jet airport. On top of all that, you’ve got some great dining options and plenty of open space at the nearby Lower Seletar Reservoir. Click here to read all about the perfect family day out in Seletar! Closest MRT: Jalan Kayu MRT is a 20-minute walk away. The 102, 103 and 117 buses also stop nearby on Seletar Aerospace Drive. This one’s for the nature lovers! Our videographer Michell, who visited each and every one of these playgrounds to put together this awesome video, deemed Pasir Ris her favourite due to the combination of its idyllic waterfront setting, its huge range of equipment – including a climbing pyramid, rope bridge, zip lines, long slides, swings and more – and other nearby attractions within the park like fishing and pony rides. Not only is there lots of well shaded playground equipment for all different ages, but it’s really spread out, meaning kiddos are less likely to be playing on top of each other (plus they’ll get worn out running from one attraction to the next – bonus!). Closest MRT: Pasir Ris MRT is about a 20-minute walk away. The 403 bus stops across from the park near Pasir Ris Way. This old school adventure playground is a total classic! Kids of all ages will go crazy for the tilting train that features a series of climbing tunnels (it can be a bit scary for kiddos under 3, though). You’ll also find multiple slides, swings, a flying fox, and a spinning merry-go-round. Be sure to BYO buckets and spades, mama, as there’s lot of nice sand for digging and sand castle building, too. The playground is in the middle of Tiong Bahru Park, which is fairly compact but has a lovely gazebo, some big steps for climbing, and a few paths that are perfect for scooting. Closest Car Park: Tiong Bahru Park Carpark; click here for location. Closest MRT: Tiong Bahru MRT is a 10-minute walk away. Multiple bus lines also stop at the park. This playground isn’t huge, but kiddos rate the giant climbing pyramid that its centrepiece. There’s also a cool obstacle rope course, a long slide down from the top of the pyramid, and no less than four flying foxes. You’ll also find plenty of sand for digging, and other toddler-friendly features. The park also has a nice wide open expanse for kite flying! Consider yourself warned that there’s a McDonald’s nearby, mamas. Closest Car Park: West Coast Park Carpark 3; click here for location. Closest MRT: Haw Par Villa is about a 30-minute walk away. The 175 and 176 buses stop by the park. What's YOUR favourite playground, mama? The handy map above shows where you’ll find our top 10 faves; tag us on @sassymamasg to let us know which ones you like best — or if there’s something we’ve missed! Happy exploring, mamas!